Ubuntu is one of the most favorite operation systems. It is free, it is easy to install it to any PC, you do not worry about viruses and other no good things, which Windows systems have. But in Ubuntu you can have different problems with proprietary software and drivers. 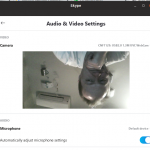 One of the common problems with Ubuntu is the upside down image from webcamera in Skype.